They're not quite tweens yet, but as most will be glad to tell you, they're not little kids, either. Most 9-year-olds fall somewhere between "little kid" and "big kid" on the status scale. They love doing small jobs and tasks to show that they're old enough to handle responsibility but they're not quite ready to be left unsupervised yet because — let's face it — kids will be kids. However, there are plenty of age-appropriate tasks and helper jobs that can give 9-year-olds that "big kid" feeling they crave if they want to earn some money. Here are some jobs that can help teach 9-year-olds responsibility — and, in some cases, even a skill. A 9-year-old is probably too young to safely use a lawnmower, but he can definitely learn his way around a rake. Cleaning up grass clippings and leaves is a good task for 9-year-olds. 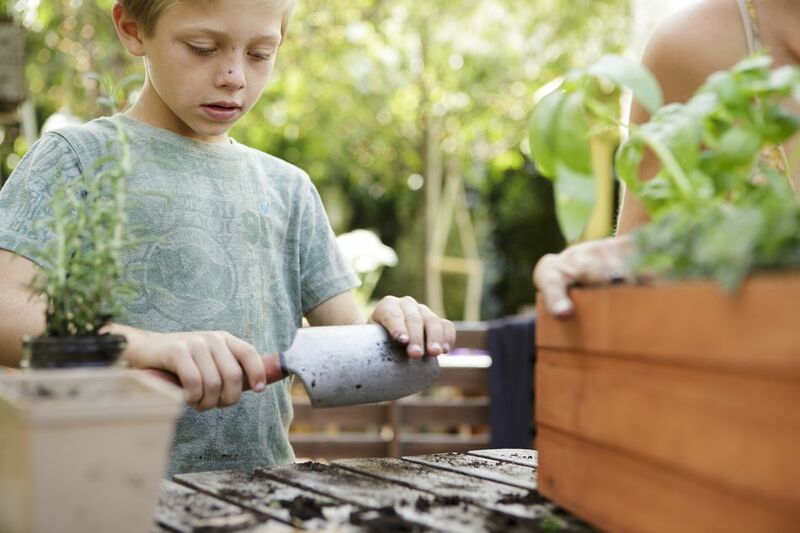 Kids can learn how to use a garden hose to clean a deck or to water flowers, too. Just gauge your child's dexterity. It might be safer for everyone involved if he sticks with the hose for a little while before you entrust him with a pronged rake. A 9-year-old is too young to babysit, but she can act as another parent's helper, minding a younger child while his mother balances the budget or his dad does the laundry nearby. This way of introducing babysitting to your child can make her feel more confident when she's old enough to care for other children unsupervised. Just be sure that the parent your child is keeping an eye on is on site at all times. Make sure you know the adult fairly well and that she's not inclined to run outside for a cigarette break or to do a quick errand, leaving your child alone with a baby or toddler long before she's ready for such a responsibility. Consider a whiteboard in a prominent place where you can list age-appropriate chores that your child can tackle along with a compensating dollar amount — her allowance for that particular task. Break her allowance down into manageable, bite-sized pieces. You can tweak the tasks to skills that match her age. Maybe she can't safely unload the dishwasher without climbing up on a chair to put the dishes in an upper cupboard, but she can stack them up on a counter for you. Age-appropriate chores for a 9-year-old might include helping with laundry, pulling trash cans out to the curb for pickup, or washing the family car. Not every 9-year-old is suited for dog-walking, but you might start by observing how your child handles the responsibility if you have a family pet. This job would require some degree of adult supervision, but it could be a good way for him to learn how and why schedules are important. The dog doesn't care if you don't feel like walking him — when it's time to go, it's time to go. But get to know the animal in question before you let your child take on this type of job with another family. Pets can be quirky. A large Dalmatian that takes off like a bullet whenever a car backfires can be very difficult if not impossible for a child to handle. And if you're a cat person? A 9-year-old can safely handle that litter box with a little instruction. House-sitting is typically more suitable for slightly older children if they're going to do the jobs solo. A 9-year-old will likely need some help. You might suggest that she acts as an assistant when you or an older sibling stop by a neighbor's house to collect the mail or water the plants while the neighbor is out of town. Give the child a specific task at each visit. This will help give her a feeling of ownership over the job and a sense of responsibility. Not everyone has this opportunity, but a family business offers a solid setting for your 9-year-old to learn about responsibility and wage-earning. He can help with small tasks like filing things alphabetically, stamping letters, or putting away supplies. But don't take your child to your workplace if you're not going to be able to personally supervise him. It's not a great idea to treat the family business as a babysitting service and expect your employees to chip in with oversight and monitoring your child's activities. Although it's not a traditional "helper" job, a lemonade stand can be a fun business adventure for kids. This is obviously a seasonal activity depending on where you live, but making the lemonade, setting up the table, and making signs are all tasks that a 9-year-old she be able to handle. Your child will learn about customer service and how to count change, both skills that will serve her well in jobs she might have in the future. An adult should be nearby to supervise and your child's lemonade stand should be on a quiet street within view of your house. Set a time limit for "hours of operation" so your 9-year-old doesn't get tired or discouraged if sales aren't going well. Check into any licensing issues you might face before your child sets up a lemonade stand. Some municipalities come down hard on unlicensed businesses, even when they're staffed and run by children. At the end of the day, age is just a number. Mozart composed his first published music when he was only 5. You know your child. You know his quirks and his talents. If Mozart's mom had suggested that he give music lessons, he probably would have aced the job, but he might have totally botched the job had he been faced with an unruly dog. Try small tasks out at home first. Identify your child's affinity. Then supervise, supervise, supervise ...and turn her loose.